The Music: Our laid back event features a diverse blend of styles ranging from Americana, Country, Blues, and Bluegrass to Electronica, Indie, Jam Band, Reggae, and Soul. The Arts: We also encourage our skilled regional artisans...painters, woodworkers, metalworkers and junk sculptors...to showcase your talents to a lively and informed audience. Past headliners include Col. Bruce Hampton, Zach Deputy, Grandpa's Cough Medicine, Rollin' in the Hay, Georgia Soul Council, The Fritz, Chroma, Roosevelt Collier, Parker Urban Band, Back From The Brink, and S.P.O.R.E. STGD is held on the beautiful Okefenokee Fairgrounds in Waycross, Georgia, a vast open expanse featuring on-site RV and primitive camping, shower and bathroom facilities, food and craft vendors, free Wi-Fi and plenty of excellent local, regional, and national music. Hosted by Safe at Home Productions, Swamptown Getdown Music and Arts Festival spun out of the organic Gram Parsons Guitar Pull and Tribute Festival, which takes place annually in Waycross, honoring the musical legacy of Waycross's own Gram Parsons, pioneer of Cosmic American Music and alt-country. For complete information, visit our official website at http://www.stgdfest.com. 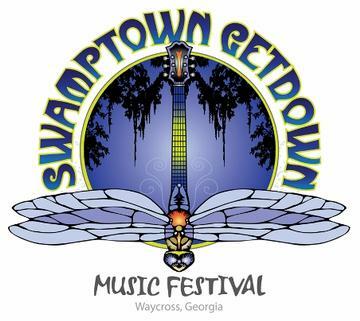 Dates for the 7th Annual Swamptown Getdown Music and Arts Festival are March 17-18, 2017. Advance Weekend Passes are $40. Gate prices are $25 per day. Tent camping is free with admission.